Several areas of the country have recently been affected by flooding. While most people are aware of the immediate dangers that occur when an area is flooded, many may not know that there are residual health risks after the waters recede. Caregivers with aging relatives living in recently flooded areas should be aware of the risks and how they can protect their family member. Floodwaters leave all sorts of bacteria and debris behind. In addition, mosquitoes breed in standing water, so the area may be a hotbed of mosquito born illnesses. Tetanus or staph infections caused by an open cut coming into contact with germs. Legionnaire’s disease caused by breathing in contaminated droplets of water. West Nile virus from being bitten by a mosquito carrying the virus. Diarrheal diseases caused by bacteria. Because older adults may have weakened immune systems, they are even more susceptible to bacterial infections and illnesses. However, there are ways caregivers can ensure their senior family members stay safe after a flood. Clean Out the Cupboards and Refrigerator: Go through the older adult’s kitchen and throw away anything that may have come in contact with floodwater. Food in sealed metal cans can be saved, but only if you remove the label and scrub the cans with bleach water. Use a permanent marker to write the contents on the cans as you remove the labels. Foods in the refrigerator are safe only for four hours after a power outage occurs if no one opens the refrigerator. After that, food should be thrown away. Frozen foods are safe for about 48 hours. Be Careful with Water: If you think water has been contaminated, don’t use it to wash hands, dishes, or foods. Drink only water that is bottled, boiled, or treated to make it safe. Wash Hands Frequently: Caregivers should encourage older adults to wash their hands more often than usual. Lather up the hands with soap and scrub them for around 20 seconds before rinsing. Hand sanitizer can also be useful, but make sure it has at least 60 percent alcohol. 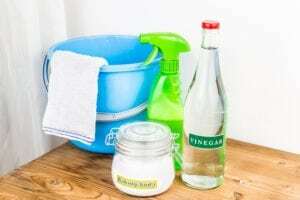 Sanitize the Kitchen: Use bleach to wash down the entire kitchen, including counters, floors, cupboards, and utensils. Throw away wooden cutting boards that can harbor bacteria even if they have been sanitized. It may be necessary for older adults to temporarily leave their homes while the home is cleaned or rehabilitated. Check with the Red Cross in the senior’s community if they need a place to stay. If you or an aging loved one are considering Caregiver Services in Salisbury NC, please contact the caring staff at TenderHearted Home Care today. (704) 612-4132. As Founder, Owner & President of TenderHearted Home Care, I have always had a heart for helping others. I started with babysitting while a teenager, assisting the mentally disabled in a work environment for 10 years, homeschooling my two sons, serving others for 9 years while employed through the local hospital and since 2011 have been focused on helping seniors to maintain their independence in the comfort of their own home. I am a Certified Senior Care Manager (CSCM) as designated by the Association of Care Services At Home (www.acsah.org). I have enjoyed volunteering my time as the President of the Rowan County Home School Association, assisting with the Parkinson’s Support Group, Walk to End Alzheimer’s, Pregnancy Support Center, MOPS International, Capstone Recovery Center, Kairos Outside, Celebrate Recovery, various church committees and going on a mission trip to Moldova. I am a member of the Rowan County Council on Aging, Meals on Wheels board member, REACH of Rowan County, HIPSS of Davidson County, Second Tuesday Business Group and several Christian Business Life Groups. I am passionate about serving others and providing the most compassionate care possible, as I would want for my own family. I love relaxing with my husband, Peter, and my two dogs, Yoyo and Terra Cotta.